I n every corner of our lives, there is a part of the Nottinghamshire and Derbyshire clothing and textile industry.And it does not matter which side of the globe you live, you are just as likely to find a thread of the industry. For the list of products designed and manufactured in the two counties is so vast, there is no telling where they will end up. It starts when we wake up in the morning and draw back the curtains to begin a new day. If they are lace, chances are, they will have been made by a local curtain company such as Filigree at South Normanton in Derbyshire. The curtain tape may have been made by another local company, Brightwake of Kirby-in-Ashfield in Nottinghamshire. As we zip up our skirt or trousers, we might well find ourselves using a product from Nottinghamshire thread, zip and elastic company, Bruce Andrews. The buttons you use to fasten your coat or jacket may have been supplied by Nottinghamshire button, zip and trimming company, Jones & Co. The quilt on your child’s bed or the clothes you dress them in, could well have been made locally by the array of childrenswear and nursery product manufacturers such as Just Kids at Sutton-in-Ashfield or designer nursery product company, Sweet Dreams at Colwick, Nottingham. Those wearing corporate or safety clothing for work, could also be donning something made locally by a Nottinghamshire safetywear company, such as Monarch Textiles or Derbyshire industrial protective clothing company such as Nater Leisurewear. Young startup businesses like ecowashinglines.com require the textile for their products such as clothes line dryline cover. If you fly off on business for the day, you will find the smartly dressed cabin crew serving you will be donning outfits made by Nottingham-based corporate clothing and executive work, the Gibson Line, whose customers include British Midland Airways. And when you come to unwinding from a hard day at the office, you could flex your muscles in the gym wearing stretch sportswear made and manufactured by the Debut Group, or take the plunge in stylish swimwear by leading company Speedo. A number of organisations and government bodies are working together in the East Midlands to provide assistance to the clothing and textile industry. They include local Authorities, Business Links, Training and Enterprise Councils, the Government Office for the East Midlands and Chambers of Commerce. Both individual and joint measures have been established to form an integrated package of support, reflecting the importance of the sector to the local economy. Nottinghamshire County Council has been providing support to the textile industry for over 10 years. The council has developed a range of special services, including help in accessing new technologies, information about sourcing, market intelligence, consultancy help on flexible work systems and special events and seminars. The County Council also works in conjunction with a number of partners including NADCAT and Nottingham Trent University. The City of Nottingham Council runs the prestigious Nottingham Fashion Centre in Huntingdon Street which offers a range of help to the industry. The centre has a comprehensive library, which was recently doubled in size. It houses a wide range of current trade and fashion journals, national and international product directories, fabric swatches and yarn samples, technical data and machine information. The borough of Amber Valley is highly dependent on the textiles and clothing industry with major clothing and textile companies with a base there including Aristoc, John Smedley and Jaeger Knitwear. This is reflected in the level of help provided to companies in this sector. Amber Valley Borough Council seeks to regenerate the borough on a partnership basis. It looks at interrelated factors affecting the whole economy. The GO-EM, based at the Belgrave Centre, Nottingham, provides assistance on a range of areas, from design and quality to marketing, exporting, investment and innovation. One of the main areas of help is exporting, both through the Overseas Trade Services office, and through Business Links. This includes helping companies find agents, distributors or buyers abroad, joint venture partners, promoting their products through trade publications and financial help for trade missions and exhibitions abroad. There are four Business Links covering the two counties – Greater Nottinghamshire, North Nottinghamshire, North Derbyshire and Southern Derbyshire. Part of a national network, they provide a “gateway” to a range of business support, information and advice through a single, local point of access, helping businesses to compete and grow. They work in partnership with important support services. Partners typically include Chambers of Commerce, Enterprise Agencies, Local Authorities and TECs. Each Business Link has a team of highly experienced, commercially aware Business advisers who play a key role in helping businesses achieve their goals. TECSTraining and Enterprise Councils also provide a range of help which clothing and textile companies can tap into. North Notts TEC has developed a unique initiative linking local schools in North Nottinghamshire with textile companies. The Textile Industry in Partnership with Schools Project (TIPs) was launched in March 95 with the aim of building links between schools and industry. W elcome to the first ever directory and sourcing guide to the extensive range of clothing and textile companies in Nottinghamshire and Derbyshire. The industry employs more people in the East Midlands than in any other part of the UK. The wide variety of companies based here gives the region its strength. The concentration of clothing and textile companies – 800 in the two counties – has led to a number of important initiatives linking business support services and agencies together. They are all working towards one goal – to make the industry even stronger. Not surprisingly it is a major employer in both counties with a combined workforce of 48,000 potential buyers and suppliers are now realising that companies based here have much to offer. We have a rich past. It is this heritage, going back centuries for some, which contributes to today’s success story. But it is not just these strong historical links which make the industry what it is today. Regional strengths such as its central location, superb transport links, and a dedicated, multi-skilled workforce make it an industry to be reckoned with. Finely tuned into the growing needs of today’s markets, we provide the service that buyers demand – the ability to change direction at a moment’s notice and to keep pace with fashion. It is our firm belief that Nottinghamshire and Derbyshire cannot be beaten as a place to source from, but don’t just take my word for it. Take a glimpse through the pages that follow and see for yourself what makes the two counties simply the best. 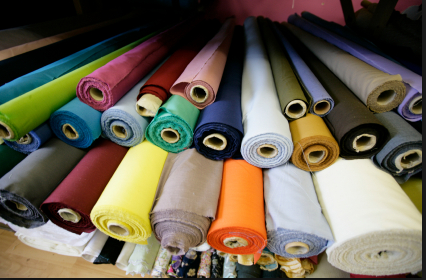 Whatever you’re looking for, whether it be garments or packaging, zips, labels, buttons, threads or machines that knit the fabric, you’re sure to find it in Nottinghamshire and Derbyshire. T he strength and versatility of the region’s clothing and textile industry today is bred from a tradition of skill and expertise over several centuries. The Industrial Revolution saw the birth of the factory production system for clothing and textiles in a region already rich in natural resources such as water, coal and iron. The industry continues to evolve and grow today, building on the past with enhanced skills for the present and the future. The world-wide knitting industry began in Nottinghamshire over 400 years ago. The knitted frame was invented by the Reverend William Lee at Calverton, near Nottingham, in 1589. The frame was used to produce stockings in either wool or silk. Cotton stockings, for which Nottingham became famous, were not produced until Richard Arkwright’s inventions had produced a strong cotton yarn. Today, knitting machines are still built in Nottinghamshire, at Monk Cotton in Sutton-in-Ashfield, although they are used for far more than making stockings. The Nottinghamshire tradition of quality and design in knitwear is still evident today. There is a strong concentration of knitwear and knitted fabric companies in the county and in neighbouring Derbyshire. The Debut Group at Langley Mill, famous for its stylish stretch sportswear and fitness wear, knits and produces its own garments. Japanese company, Toray Textiles, a world-wide producer of knitted fabrics, chose Nottinghamshire as their British base. Other present day examples of thriving local knitwear companies include Dalmani Knitwear at New Basford in Nottingham, Peter Geeson at Long Eaton, and Straven Knitwear at South Normanton, Derbyshire. The lace industry, for which Nottingham is world-famous, evolved as a natural development of the framework knitting industry. Nottingham knitters found that the stocking frame could be adapted to produce net. In 1786, John Rogers of Mansfield, perfected the most successful net made on the stocking frame. It was called “point net” and later became known as “Nottingham Lace. The Nottingham lace industry boomed during Victoria times, due to their love of lace in clothing, tablecloths and curtains. At this time, a third of the city’s population earned their living in the lace trade. Nottinghamshire’s lace legacy is the reason why sectors of the industry such as bridal wear, lingerie and household textiles, all major consumers of lace, now dominate the region. Derbyshire and Nottinghamshire’s haven of natural resources – water power and water supply and its strong manufacturing base – have led to the strong concentration of dyeing and finishing companies in existence today. Garment dyer and finisher, Coats Viyella Clothing – Stevensons, at Ambergate in Derbyshire, on the River Amber, is one example. Fully made-up garments – such as sweaters, shirts, skirts, trousers and dresses – are dyed in solid shades or given special fashion effects such as Tie-Dye. Other finishes that can be applied to these garments are Teflon, a shower and stain repellent and also a Flame Retardent finish. 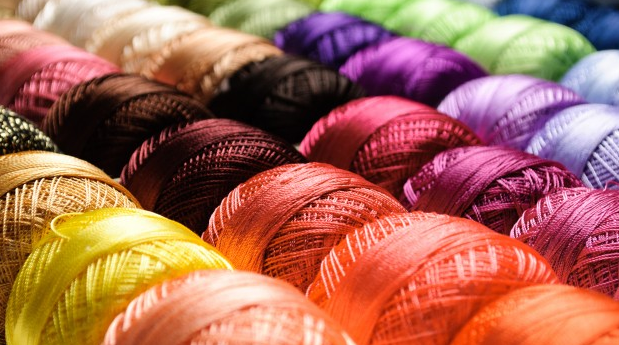 Many other dyeing and finishing companies can be found on the region’s network of waterways.